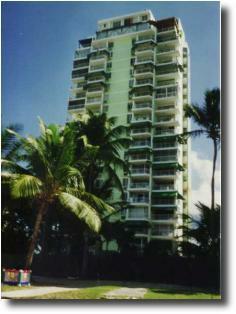 This 2 bedroom oceanfront condominium apartment in the Reina del Mar complex located in San Juan's Isla Verde District. It is tastefully decorated and furnished throughout with all amenities. It includes cable TV/ with VCR and Stereo. This eigth floor apartment offers two spacious bedrooms with air conditioning; and an ocean facing balcony for relaxing and enjoying the views and action. The unit also includes a washer/dryer combo. 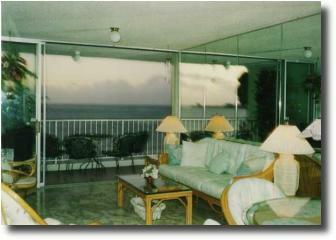 A 2 bedroom 1 bath apartment with fully equipped kitchen, Air conditioning, Cable TV w/VCR, Queen Beds, all bed and bath linens, secure off-street parking, ocean facing balcony, located in the popular Isla Verde tourist district of San Juan, Puerto Rico.